The last time I was in Wilmington, dining options were mostly pretty standard fare. What a difference a few years make. The only restaurant I have from there in my book is Catch, but here are the ones I’d add now for their attention to local sourcing: Deluxe, Circa 1922, Caffe Phoenix, and Crow Hill. There may be others but those are the ones that I’m confident are committed. Feel free to disagree and/or add others. 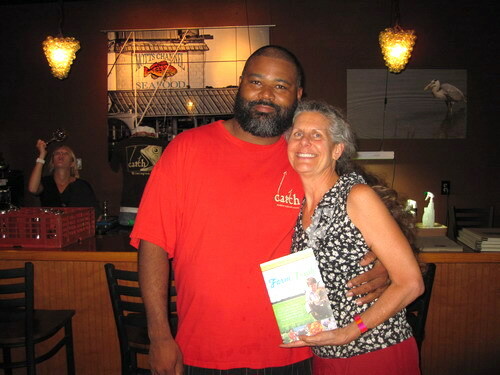 Friday night we ate at Catch, and I finally got to meet chef Keith Rhodes. Catch has two locations, a tiny one downtown open only for lunch weekdays and a larger, but still fairly small, restaurant in a strip mall six miles away from town. We started with beers – OBX, a Kolsch style ale from Weeping Radish Brewery, and a salad with diced sweet potatoes that were perfectly grilled. For dinner I had tender black grouper with sweet potato mash and succotash (which seems to be all the rage this year). Lina loved her perfectly blackened amberjack, cheese grits and sautéed spinach. We also admired the artwork on the walls, metal fish by Matt Davis. 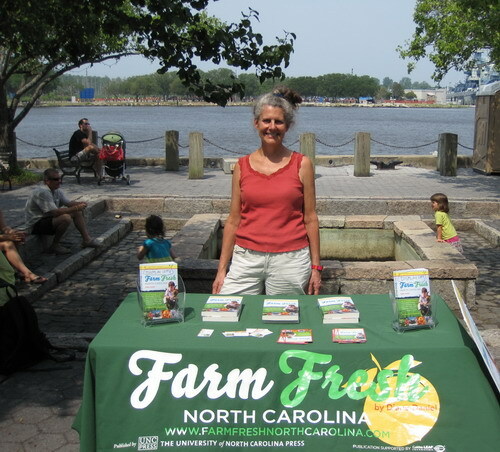 Saturday started with book promotion at the Riverfront Farmers’ Market, which shares best-view title with the Elizabeth City market, as both overlook rivers. There I met Jane Steigerwald with the very impressive local-food program FeastDownEast, aka Southeastern North Carolina Food Systems Program. Projects include farm-to-chef distribution and a farm-fresh restaurant branding program. My next stops were Costco, where, despite the big-box location, I signed 20 books to enthusiastic fans, and then the cute Pomegranate Books, featuring nibbles from farms my book. Yummy! We dashed back downtown to meet up with Liz Biro for the last 90 minutes of one of her three-hour “Culinary Adventures.” I’ve been on several food tours in several cities, and Liz’s ranks as one of the best. She makes an impressive EIGHT stops, guests are well fed (not always the case on food tours, believe it or not) and Liz knows her stuff. She also does a good job of posing leading questions to owners and chefs. 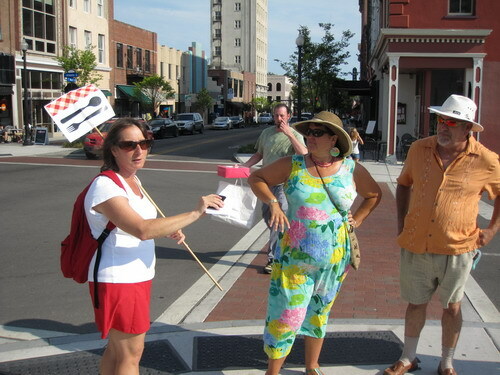 Liz is well known around town for her food stories and reviews in the Wilmington Star-News. Thanks, Liz, for letting us drop in! 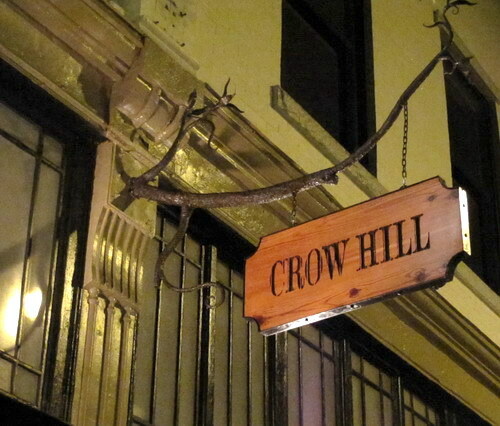 Saturday night I was excited to eat at Crow Hill, which I’d heard about from a few sources. It’s near the riverfront, which really heats up on weekends when gaggles of twentysomethings flock there. Crow Hill sports a sophisticated uptown look, but in a warm way, in part thanks to the salvaged river-wood tables and yard-tool-inspired sculptures on the walls. I could have used a lower volume on the dance club music, but maybe that’s my age talking. I didn’t have a full appetite thanks to the food tour, so ordered two appetizers, while Lina had an app and entrée. Our server (Sarah!) was memorable — fun and on the ball and she really knew the menu. Food, too, was amazing. I started with a smoked trout salad topped with a deep friend poached egg. Lina’s fish stew starter was too spicy for me but perfect for her. The outer edges of her lighly smoked pork loin (with creamy grits) were a little dry, she said, but the interior was just right. My “entrée” was heavenly – herb-garlic roasted mushrooms over creamy polenta. Got to get back to Wilmington soon! I wrote this very detailed story with lovely photographs for Blue Ridge Country magazine. It’s in the current (July/August) issue. The four-night roadtrip, with itinerary, takes you from Asheville to Ashe County, with great sights and food stops in between. Check it out and hit the road! Wrote this little ditty below for a Boston Globe summer-fun roundup that ran last weekend. 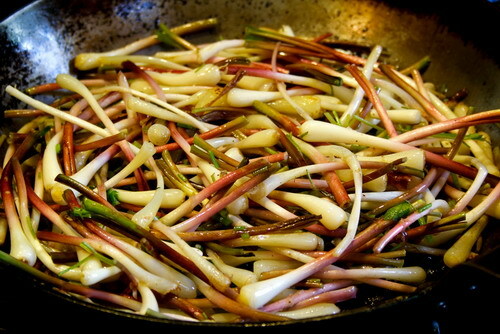 Freshly sautéed wild ramps, an Appalachian specialty. Photo by Kevin Gregory. With farm-to-table dining practically de rigueur, farmers are starting to share the menu with foragers. In what is billed as a ‘‘forest-to-table’’ dinner series, ‘‘No Taste Like Home’’ in Asheville shows guests how to reduce their food miles to the ground under their feet, and a bit beyond. Diners, led by veteran wild crafters, will stalk the Appalachian woods and meadows for such ingredients as sunchokes, chickweed, and even the much-maligned kudzu. After a few hours of hiking and hunting, foragers will retire to the kitchen, where a visiting chef will whip up earthy delights that might include chickweed salad with persimmon vinaigrette, stinging nettle pesto, and morel and ramp ragout.Sounds wild. 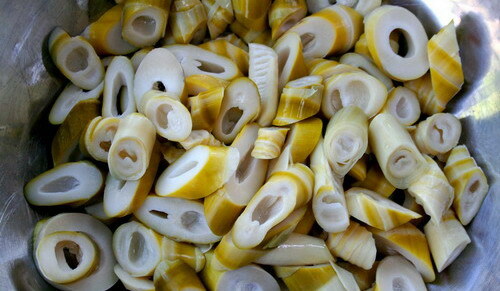 Locally harvested bamboo shoots ready for cooking. Photo by Kevin Gregory.